The Wonder Years have followed up their sophomore album The Upsides with another batch of realist pop-punk stories in Suburbia I’ve Given You All And Now I’m Nothing. The June 14 release of Suburbia is replete with catchy lyrics from frontman Dan “Soupy” Campbell and the other five Philly guys, struggling with growing up and out of their hometowns. The band does come out swinging as the first track’s title suggests. Changing labels (from No Sleep Records to Hopeless Records) has brought about a stronger musical style. Most notably, drummer Mike Kennedy shows his growth in “Coffee Eyes” and “Woke Up Older.” His energetic, precise and more intricate drum beats give the feel-good, yet somber and serious, lyrics dimension. Suburbia tackles death, religion, loneliness and small-town mentality in 13 tracks. The fastest track lyrically and musically is “You Made Me Want To Be A Saint,” but it’s the most heartfelt. The lyric “I know you would want this to be a fast one” describes the song as a tribute to a friend who had passed. Suburbia’s maturity proves that pop-punk isn’t just for a younger crowd. Campbell and the band are doing a good job at making pop punk real music once again, as they often quote each other in real-life instances throughout songs. They manage to maintain the “Head Above Water This Year, Boys” mentality (from the 2008 EP Won’t Be Pathetic Forever), but the band has reached a new level of truth and realism as they sing about watching “heroes turn human” in front of them. 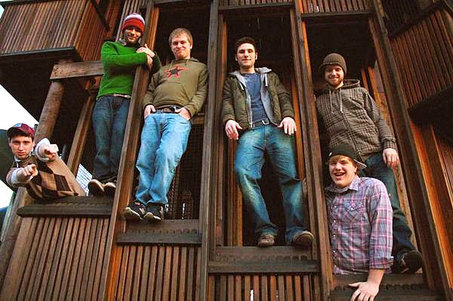 The storyline in The Upsides led to The Wonder Years touring the album in its entirety. Add Suburbia on to that, and they’ve created a sort of narrative with depth. While the album doesn’t have a distinctly stronger section, “Summers in PA” is a highlight with its great nostalgic feel of old friendships from home and “weeknights in the summers.” Guest vocals from For Year Strong’s Dan O’Connor and Alan Day add to the happy hooks. If there is a weak part of the album, perhaps it’s the simplistic lyrics, but that’s part of the real, stripped image The Wonder Years are going for. The clean guitars in the mid-section of “Local Man Ruins Everything” accompany this well. In a recent interview with AbsolutePunk, Campbell reflects on the record and the direction he wanted to take. “We set out to make a record that stayed grounded in pop punk but stretched itself in new directions,” he said. Suburbia is nostalgic, but looks forward at the same time, even to another album. The Wonder Years are no longer as Campbell also described to AbsolutePunk: “a pigeon of the scene” that nobody wants.